Dreambox is quite a powerful Linux satellite decoder that has many great features with additional addons installed. But even without that, its default setting is more than sufficient for average users. If you aware, users can actually program the time on when to start the recording, go to standby mode and so on without users’ intervention. 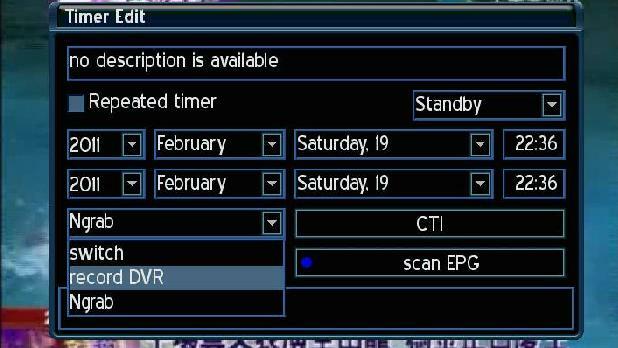 On remote control, go to Menu -> Timer. Under Timer List, press on Green button to add new timer. In the sub menu, users can define a new description for timer, either one time or repeated timer. Then in the next field, just fill up the respective year, month, date and specific time when you want the incident to happen. Click on Green button to apply and save the changes. By now, you should see the new list appear under the Timer list. Repeat above steps to add new timer event. Just in case you would like to remove the timer, just press on Red button to remove, or Blue button to cleanup the whole lists. This is indeed very useful especially users can program the timer to count down so that the box will enter standby stage as desired. Besides, there is also a way to switch to specific channel or make DVR recording when the time reaches, which makes it very convenient and useful for those that would like to follow on certain movies or programs without miss.